This course explores key aspects of the social, economic, and political development of the United States from precontact to the present. Students will examine the contributions of groups and individuals to the country's evolution and will explore the historical context of key issues, trends, and events that have had an impact on the United States, its identity and culture, and its role in the global community. Students will extend their ability to apply the concepts of historical thinking and the historical inquiry process, including the interpretation and analysis of evidence, when investigating various forces that helped shape American history. In this introductory unit, students are introduced to the concept of history and are presented with the tools that historians use in their everyday investigations. In this way, they will become familiar with the four different concepts of historical thinking: historical perspective, cause and consequence, continuity and change, and historical significance. 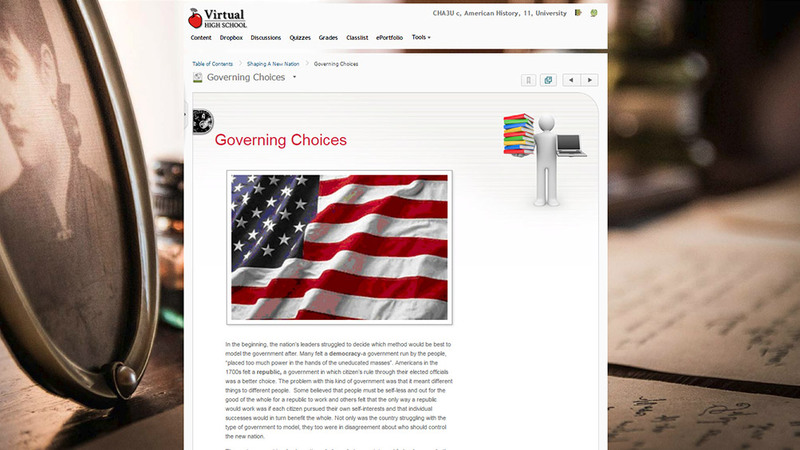 Students are also introduced to the steps in the historical inquiry process and have the option to practice locating research-based sources that you will use throughout the course. In unit two, students explore the early roots of American history from the Native Americans, to colonial settlements, and finally the American Revolution. This unit begins with an exploration of the rich and diverse Native American societies that existed prior to European contact in the present-day United States of America, focusing specifically on the Mississippians and the Iroquois. These Native societies were deeply impacted by the establishment of America's first colonies. Students learn about colonial life including economic structures, political systems, and social and cultural life in the colonies. The unit concludes with an investigation into the causes and events of the American Revolution before exploring its long term political impact on the development of democracy in the United States of America. In unit three, students explore the foundation of the United States of America following the Revolutionary War. Having declared official independence from the British Empire, the Americans set out on a course of nation building; at home through technological advances and an industrial revolution, but also abroad through Manifest Destiny. Students also explore domestic political, economic, and social conflict by studying the institution of slavery and the American Civil War. This unit concludes with a study of reconstruction. In unit four, students explore a series of global conflicts, most notably World War I and World War II and the role that the United States played in these conflicts and the way in which they contributed to a growing American identity and superpower status. In addition to conflict, America also experienced tremendous economic growth and depression in the 1920s and 1930s. Students will learn how these different economic periods contributed to widespread social change including the realization of rights for women and African Americans. In the 1960's, presidential initiatives, judicial rulings, and social protest movements generated reform. Students will learn about, the women's movement, the youth movement and the environmental movement and how they changed people's lives. Students will also learn about America's shaky start to the 21st century, including the events and long term consequences of the 9/11 terrorist attacks. Finally, students will analyze the vastly different Presidencies of Barak Obama and Donald Trumpâ€”whose lasting legacies have yet to be realized. This moment in America is simultaneously one of hope and desperation. As a final culminating assignment, students will complete a Virtual Museum Exhibit. This project is worth 10% of the final grade.